This man has seen the void itself. Commanding the crew of the chosen few, he led the Expedition 35 aboard the International Space Station and orbited planet Earth as he sang about it while the world listened through the Internet. His broadcasts from the Space Station allowed us to get a glimpse into life at the edge of our world. But what goes on inside the head of an astronaut? What keeps you sane and grounded in outer space? What is harder to manage while commanding a space mission – men or machines? To answer all this, we are joined by astronaut, ISS Expedition 35 Commander, and author of bestselling books about his space experiences – Chris Hadfield. Sophie Shevardnadze: Chris Hadfield, space-faring veteran, Commander of the International Space Station's Expedition 35, welcome to the show, great to have you with us. Now, Chris, you were the first astronaut to actively use social networking - streaming your space experience for millions of those back at home. It was a tremendous success - was that your idea? Or was that some kind of mission that you were given by the command? 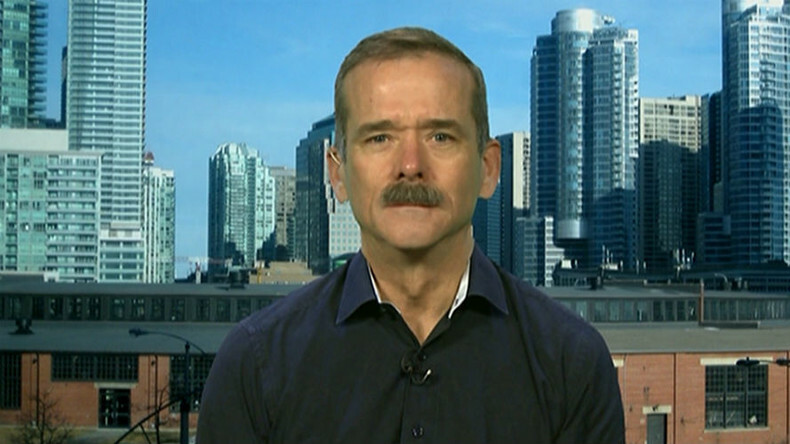 Chris Hadfield: I think, for all astronauts, Sophie, the experience is so fantastic, it's so rich, it's so different, that you try and share it anyway you can. On my first spaceflight all I had was ham radio, emitter radio, and a film camera, so it's really hard to share, but on my third spaceflight as you said when I was commanding the ISS, we had Internet, it was primitive, but Internet on the space station and digital cameras and high-speed video, and so I could share the experience like never before. The reaction, as you said, was huge. I think it's too good an experience to just keep it to yourself. SS: The guitar you used to play "Space Oddity" on board the ISS, was put on board the station by the psychological team - what for? How did the guitar help you in space? Just take your mind off work? CH: When I was onboard of Stantsiya Mir, of space station "Mir" in 1995, there was a guitar on "Mir", made in St. Petersburg, and when I played that guitar up on "Mir", I realized just how important, and warm and human that music is, and I think that NASA psychiatrists recognized the same thing, and so when the world was building the ISS, with all 15 different partners, they agreed that not only should we have all of the scientific equipment and the health and food, but maybe some mental and soulful kind of help, and that's why they put the guitar on the ISS. This time, it's a Canadian guitar, which is nice, it was made in Vancouver, a Larrivée, and it's still up there right now, Sophie, it's on the space station. It's been up there, it must be, for up to a hundred thousand orbits now, the most travelled guitar in all history, but it was lovely to have a chance to play and think about where we are, both in a place and in history, and music is a wonderful way to do that. SS: Talking about where you are and talking about psychological dangers - through one of portholes you could see home, so to speak right, and through the other - that's an endless void. Has that been difficult to cope with? What mental issues did you face while working on the ISS? CH: I think it's really a matter of perspective, Sophie, because here, standing on the surface of the Earth, if you look down - you're home, but if you look up - it's an endless void. So, it's kind of... how used you are to the environment that you're in. Onboard the spaceship, the world is in the distance and you're surrounded by the eternity of the Universe, but there's a great beauty to it, and sort of, like an infant leaving home, you're taking your first steps and starting to experience the rest of everything else, and there's a great sense of wonder and a lack of understanding, but also dawning awareness of just how small your home is, and how enormous everything else is, and I think that perspective is what really sits in your mind and overwhelms your feelings, it is the muteness of it, the beauty of it, the opening of understanding that comes from it. That's what's in your mind most of your time as an astronaut or a cosmonaut aboard the Space Station. SS: As a commander on the ISS, you're juggling your responsibility between machines and people- all stuck for months on end in very tight living conditions. How difficult was that part of your job? CH: To command the crew of the ISS, like the six people that are up there right now - it's a big responsibility. The Space Station is very complicated. It's a machine that keeps you alive that's going 8km/s, 28,000 km/h - but it's also life or death, all the time. The crew onboard is counting on each others with their lives, with every single decision, and every action. So, that's quite a challenge for the leader, for the person who is the commander of that crew, to understand the technical complexity of this ship, but also the psychological complexity of the crew,and to keep all of that working in harmony - and that's why we take it so seriously. I trained and worked as an astronaut for 21 years, I was NASA's director in Russia, I lived in Star City, Zvezdny Gorodok, for about 4,5 years and got to know my crew as well as I possibly could. We trained together for years before launch, just so that when we got away from Earth and we're trusted with all of the responsibilities of running a spaceship, that we would be as not just technically competent, but as completely competent as a group of human beings as possible, and my job, as their Commander, it was through that whole period - selection, training, launch, the whole time in space, and then, afterwards, and I'm very happy with the level of success that we had as a group of six human beings. SS: The missions are all multinational - but with all kinds of political tensions on Earth right now, does that creep into the mission, how do you manage that, or all these issues are just left behind on Earth? CH: Astronauts are not infants or ignorant about most of the things that are going on around the world, it's a very competent and interesting group of people. Onboard, right now, I think there are 3 or 4 different nationalities and that's normal. But we recognize that politics are transient, and often, the most exciting, noisy types of politics, are the most transient - but meanwhile, we're exploring the rest of the Universe. We are finding a way, despite the transient disagreements of cities and townships and counties and countries and continents - meanwhile, we are also finding a way to cooperate, to explore the rest of the Universe. Yeah, there are some pretty serious tensions down here on the surface, and some of them - very well founded, but there are also some things that are bigger than that. Sometimes, you really need a good example, you need a good, shining, clear example where human beings are cooperating - and the Space Station is as good an example, I think, as exists right now. The beauty of the Space Station is that anybody on Earth can walk outside at dawn or at dusk and watch the Space Station - it's the brightest star on the sky - go over the top of their heads. So, maybe, when people need that type of symbolism the most, it's nice that it actually exists with six human beings onboard, finding good ways to cooperate. SS:Lots of studies are performed on the ISS - but most of the time, it is actually astronauts who are being studied by scientists back on Earth. Forgive my ignorance, what do the astronauts and cosmonauts actually do on station, besides maintenance? CH: The Space Station has about two hundred experiments running, and part of the experiments, as you say, Sophie, are studying the human body, just because when you take away gravity, it significantly changes how the human body works. So, it's a way to study our functioning that you can't study on Earth, like, how does the human balance system actually work? How does does your blood pressure regulation system work? How does your immune system work? How does your vision integrate with your balance system? So, there's a lot of things, just because we're in that laboratory that we can study, so we take advantage of it. We're also, of course, interested in going further, we want to go and stay and live on the Moon, and eventually, travel as far as Mars, so you have to somehow learn all of the details and study it and figure it out. So, we study the body for those reasons. But most of the experiments are actually for other purposes: staring up in the Universe, trying to understand the rest of everything else. We have telescopes, we have huge alpha magnetic spectrometer, trying to figure out what Dark Matter, Dark Energy are, looking at the subatomic particles from the Universe; and then, a tremendous amount of experimentation and recording is looking at the Earth itself - because the Station goes around the world 16 times a day, and it has been since 1998 and it will be till, probably, at least 2028, it's a tremendous platform for understanding the world itself. So, it's an observatory. And then, we do experiments onboard: in fluid physics, in flame, in nano-particle behaviour, in capillary flow... It's a really busy hotbed of experimentation. So, the astronauts are laboratory rats, you know, we're the subjects, we're the laboratory technicians, we're the observers, and we're also the maintenance people, keeping the whole space station healthy, and we even go outside on spacewalks to fix things as they break outside. It's a busy life, fascinating life, and sort of, right on the very edge of research and exploration. SS: Now, when you take off, you’ve said the g-force is like pouring heavy concrete poured all over your body, you're under insane pressure, but does it feel like when you break free of gravity and the g-force goes away? SS: What is the sensation like? CH: Right now, you and I sitting and talking to each other - gravity is crushing us down. So, as soon as gravity is gone, instead of feeling butterflies or weightlessness, you actually sort of feel like you're being pulled up, just because you're so used to being pushed down. So, you sort of feel like you're magically being floated up towards the ceiling, and it's wonderfully liberating. You can somersault, you can push off with your toes and fly around the room. It makes everybody laugh. As soon as you get to weightlessness and make sure that your ship is healthy, everybody laughs, because so much fun to be weightless. In my whole 6 months that I lived off of the Earth, you play with weightlessness all the time, just your watch on your wrist floats around and you tumble and fly and you're the world's best gymnast. Everybody would love weightlessness. SS: How do you get over the more mundane changes about zero gravity? Like moving around, it’s not like you can swim through air. So you push off the surfaces of the station? Or you must know every route around the Station by heart by already? CH: When you first get to weightlessness, when the engines shut off, you're clumsy, you keep banging into things, you bump into stuff, and when I first came onboard the Space Station, I could just see the crew that was living there, they were just cringing watching us clumsily bumping into this, knocking stuff off the wall... But after a while, you start to get a hang of it, you start to become elegant, and, maybe, like a fish in the sea, or a porpoise or something, where you can move delicately. And don't normally push so much as you pull - you give a little tug and you balance and you pivot and turn, and you become quite graceful. There’s almost like a gentle ballet feeling to how you move in weightlessness. You don't want to get going too fast, because even if it's easy to get going fast, you still have to somehow stop, and you still have the mass of your body, so you've got to stop at the other end. So, people move quite elegantly when they get used to it, onboard the spaceship. SS: How do you keep your arms stuck to your sides in zero gravity? Is sleeping strapped to the bed as satisfying as sleeping on Earth? CH: If you've ever seen the image of an infant before they're born, of a fetus in the womb, and you see the posture that their body is in, where their arms are sort of floated up and their knees are floated up, and their head is tipped forward - that's the natural resting position of our bodies when it's suspended in the fluid, or when you're weightless. So, if you just completely relax your body in space, your arms will actually float up to about here, and it's just the relaxed position. So, you don't ever have your arms down by your sides in space, that's a gravity thing. If you don't believe it, stand on your head, and your arms won't be down by your sides. So you just get used to the fact that everybody's arms are floating here, or you're deliberately holding on with one hand and then your other arm is doing something. It's just the new normal. It's different and you just live with a different posture, but I prefer it. Weightlessness is much easier and gentler, and maybe, even more natural, somehow, that always being crushed down under gravity. SS: Sleep is a bit topic for me, I sleep 10 hours a day, so... I'm very worried for you - how do you guys sleep strapped to the bed over there? Do you find it tough to get a good night's sleep in space? CH: When it's time to go to sleep, and, of course, since you go around the world in 92 minutes, you've got a sunrise or sunset every 46 minutes. So you can't go just off the regular patterns. You just go of time of day, we chose Greenwich time, same time as London, England. So, when it's bed time in London, England, here's what you do: you put on pajamas, because you might have to respond to a problem during the night, and then you float down to where your tiny little bedroom is, and floating on the wall is your sleeping bag. It's just tied with a string, and then you float up and around, you fit into this sleeping bag, you put your arms though the arm-holes, you zip up your sleeping bag, you close the little door, and then you shut off the light - and now you're in a small, perfectly quite, perfectly dark place, and every muscle relaxes. Your arms float up, your head tips forward - and you're not strapped to anything, you're floating, just gently constrained by just the cloth of your sleeping bag and you don't need a pillow, you don't need a mattress, you never have to roll over, your shoulder doesn't get sore, every single muscle in your body is relaxed. It's the most comfortable sleep you've ever have, the most comfortable that you can ever imagine. You'd love it. SS: Oh my God, that sounds like a perfect therapy for my back. CH: You'd love it, it's good for your back. I think, when Elon Musk and company figure out the way how to make spaceflight a little more affordable, I think people will really enjoy the experience of spaceflight, just for the weightless sleeping. SS: So, we're talking about all the upsides right now, but I know that you walked three times in space and you went temporarily blind during your first spacewalk. But other than that - what goes through your head when you fly through nothingness? Are you too concentrated on a task at hand to think about bigger picture? Or do you actually constantly look around in awe? CH: When you're flying on an airliner, on Aeroflot or something, part of the crew onboard, the pilots up front, are extremely focused on operating the vehicle, and they are paying attention, and they are professional, so that the passengers in the back can relax and look out the window. Spaceships right now are like super-complicated airliners, so that most of the time, everybody onboard has to be very focused on operating this ship - just pilots of an airliner or a big ship or something. But, sometimes the ship is working fine, as you say, you're flying through nothingness at 25 times the speed of sound, and you let yourself relax, and you can pull yourself over to the window, and see the magnificence of the world, where you cross Russia is 10 minutes, from one side to the other, biggest country in the world, around the whole world in 92 minutes - so, you really start to get a sense of a beauty that surrounds you. You're focused all the time on listening to your machine and being ready to react. There's no passengers onboard the space station yet, but, eventually there will be, and we'll get artists and people up there that can really express the magnificence of it. For now, we have to be able to be the crew, we do our best to explain it to everybody, and even to explain it to ourselves, but it's still kind of a busy, professional, technical place to live and work. SS: Astronaut Scott Kelly said it's surreal to realise that there’s nothing but the space suit separating you from instant death - just a few inches away - have you ever thought of it like that? CH: Yes, like other astronauts, including Scott, I've done some spacewalks... I think what's really, sort of, thought-provoking in a spacesuit is that it's just made of cloth, and it's only a little bit thick, and it's an inflated balloon around you, and just on the other side of it is the emptiness, the vacuum of space that would kill you, really, in one breath. So, you do kind of recognize that it's a very fragile, little human invention that is allowing you to stay alive, but, when you’re driving your car down the highway at 100km/h, that's kind of, sort of the same thing, or if you scuba-diving, and you're 20 or 30 meters under the water - you recognize you could be dead in one breath down there, too. So at some point, you have to say: okay, technology is good enough, and I'm trained and competent and ready enough, that even though this isn't a natural environment for me to be in, the technology is good and I'm trustworthy, and therefore, now, I can be in a place that otherwise I could never be, scuba-diving, or, even more magnificently, on the other side of a spaceship, holding on with one hand with the whole world just going by beside you. You get over the danger of it, and you accept it, so that then you can really let yourself to be immersed in the wonder of it. SS: I do imagine you experience some sort of cognitive dissonance all the time, because, I mean, you miss Earth, when you're in space, and you probably miss the sense of being in space when on Earth? Which sense is stronger? CH: I try not to live in dissonance, if I can. I try and accept where I am, and not wish that I were somewhere else, and I think that helps, especially when you're doing something really complex, because if a large part of you is worried about just being there, or if it's wishing that you were someone else - then it's hard to properly exist where you are, concentrate on what you're doing, or make the most of where you are. Trying to be as accepting as I can and open to what's going on, so that I can contribute the most, and hopefully, I can receive the most, also. SS: I’ve spoken to several people who’ve been to space or who study space - and nobody denies the fact that there’s got to be other life out there - do you believe we’re alone in the universe? CH: It's not a really a belief issue, Sophie. It's like, do you believe that this is shirt? Well, either it is or it isn't, it's not a belief - it's kind of an interesting way to phrase the question. Do you believe that one and one equals two? Well, it's either a fact or it isn't - it's not really a belief. The real question is, have we found any evidence of life yet? And the answer is no, we haven't, we're looking - that's why we're driving around on Mars, and actually why we're going to dive close to the rings of Saturn here, shortly, and why we're looking on the moons of all of the other planets, and why our telescopes are looking for other stars, for other planets - we're trying to answer that question, so that is not just some sort of weird belief, but it is just a fact, like whether there's life on Earth or not - yes or no. So far, we haven't found any evidence. The statistics, the odds, are pretty overwhelming. The more we look, the more find, and we've pretty much know that every star has planets, and we could almost guess how many stars there are - just by looking through our best telescopes. The numbers are staggeringly huge, somewhere like a septillion - which is such a big number, may as well be infinite. And if there's a septillion planets up there, and billions of years of time - to think that we're the only life in the Universe seems just kind of arrogant and ignorant. But, until we find any evidence, nobody knows. So I don't know the answer to the question. That's why we're exploring, that's why we're looking, that's why the 6 of us are up on a space station right now - we're trying to find out, amongst all of the other things, whether we're alone in the Universe or not, we just don't know. SS: Chris, it's been so wonderful talking to you, hopefully you will bring me back news about life in space, sometime soon. Good luck with everything. We were talking to Chris Hadfield, astronaut, spaceship commander, and bestselling author, discussing his experience onboard spacecraft and in outer space, and talking about the future of spacefaring. That's it for this edition of SophieCo, I will see you next time.